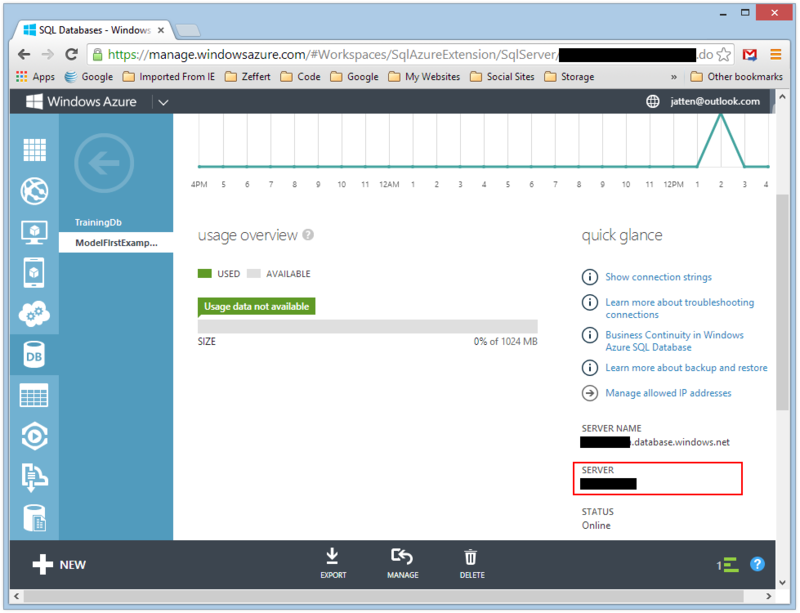 One of the coolest things about Windows Azure Websites is the integration with source control, and the automated deployment hooks Azure offers. However, there are a number of small gotcha’s related to deployment, chief among these is the protection of confidential configuration items such as database connection string. In this post, we are going to look specifically at the vexing situation I ran into deploying from source control with an application using Entity Framework’s “Model-First” strategy (everything here is pretty much applicable to “Database-First” as well, since in terms of the conceptual modeling of the database within the application, they are the same). NOTE: If you are an MSDN Subscriber, you can access free Azure benefits. If you are not an MSDN subscriber, you can still have up to 10 Windows Azure Websites for free. Additionally, anyone can take advantage of an introductory free 30 day trial to check out the rest of the Azure platform. If you wish to take advantage of Windows Azure Websites Deployment from Source Control feature, and your application uses Entity Framework’s Model-or-Database-First approach, there are some non-intuitive set-up concerns that need to be addressed before your deployment will work properly. 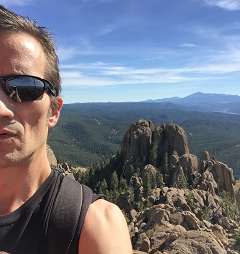 When you use Entity Framework to either build a database based upon the model you create in the VS Entity Designer, or use EF to reverse-engineer a conceptual model from an existing database, EF creates a bunch of meta-data mappings used to manage the interaction of your application with the database. Unlike the “Code-First” approach, in which much of the meta-data exists as annotations on your model classes which EF then uses to create and map the relations of your classes to the database, the Model-First paradigm leaves you with straight POCO (“Plain Old CLR Objects” or, alternately, “Plain Old Class Objects”) classes. In the above, the first XML node in <connectionStrings> , named “DefaultConnection” is the connection string for the standard Forms Membership feature included out of the box with the default MVC project template. The second node, for the connection string named “ExampleDbEntities” is what you get when you create an Entity Framework Model First implementation of the actual domain database your application will consume. All that metadata=res: stuff essentially tells EF where to find the meta data it needs to properly relate your generated model classes to database tables, and to keep track of the relationships between them. In the example above, the membership database exists in the App_Data folder of the project. The ExampleEntities database is hosted on my local development server. As a result, both connections are able to use Windows Integrated Security, and no confidential connection information is persisted in the Web.config file. 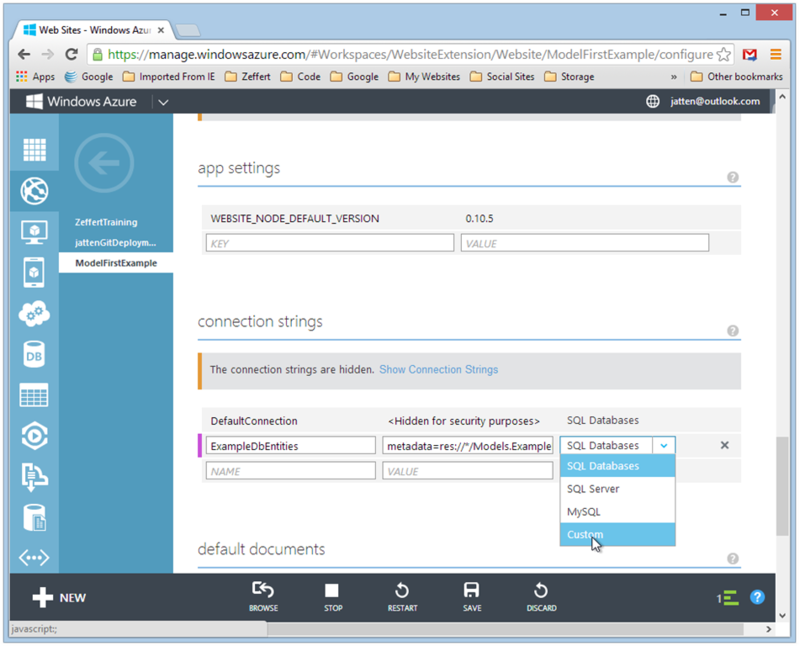 When deploying a website to Windows Azure Websites, there are any number of variations with respect to how the two-database application above might be implemented. You might create a separate membership database on your Azure account, as well as an application database, similar to the above. More likely, you might decide to combine the two such that all of your application data is served by the same Azure SQL Database instance. For this article, we are going to look at the free Websites tier, which allows one free Azure SQL Database (<= 20 Mb) for use by all of your free websites. We will also assume that you must (for whatever reason) develop your application against an existing database schema, such that the Model/Database First approach is indicated. 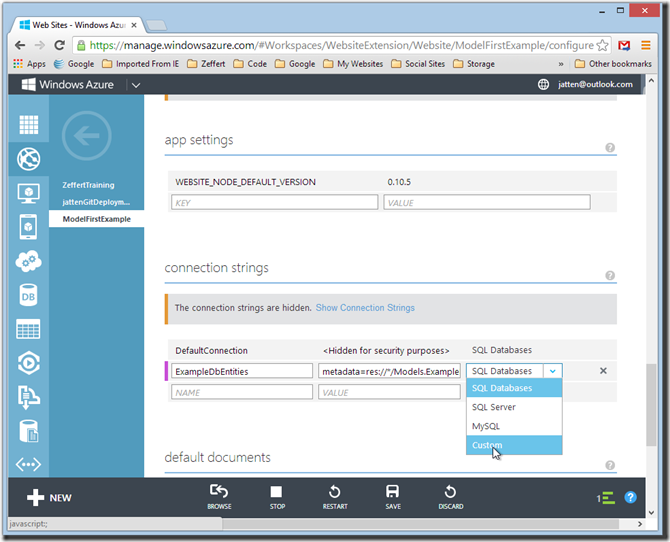 In the configuration section of the Azure Website Management Portal, there is a section specifically for setting up connection strings. 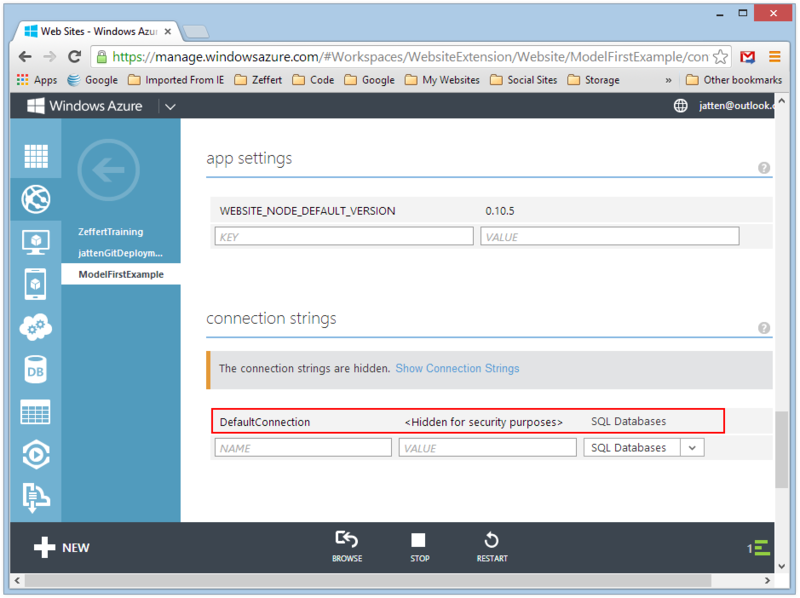 Azure connection strings are key/value pairs where the NAME field (the Key) is the name of the connection string as defined in our Web.config file, and the VALUE represents the actual connection string to be used to connect to our Azure SQL Database instance. The above is from the Configuration portal for an example I set up. I have an existing Azure SQL Database set up, and when I created the example site, the DefaultConnection string called out in red was associated with that database. When we deploy our site from source control, Azure maps the connection string names defined in our Web.config file to the correspondingly-named connection strings defined here. This preserves the privacy of our confidential Azure database connection information, since it does not need to be committed to our source control repo. Recall from the previous section that our Membership database on our local machine also uses a connection string named “DefaultConnection.” Since for our example we are presuming that in deployment the Membership tables actually reside in the same database as the rest of our application data, the connection string above is appropriate. Of course, we need to make sure to migrate our Membership tables into this database (or assume they are already there). This should work properly with the membership functions of our application out of the box, so long as the Membership data resides in the target database to which this connection string points. Now we come to the issue of our application database. Since our Entity Framework models expect a Model-First implementation, they will be looking for that funky, meta-data-laden second connection string we saw in our Web.config file. Obviously, this should actually be a single line, but I have condensed it here as much as was reasonable for readability. You can find the unmodified template at my Github repo. The value for <AzureDatabaseName> is obviously, the name of your deployed Azure SQL database. When you initially set up your SQL Database, you will have created the values for <UserLogIn> and <UserPassword> . Replace those bracketed items with the values you created with the database. So, that all seems like a lot to have read just to get to this, but here goes . . . Your DefaultConnection is already defined, and points directly at your Azure SQL Database. Assuming your ASP.NET Membership tables are all defined in your one application database, all we need to do is paste in our EF Model-First connection string, once we have replaced the placeholders with the values for our own SQL Database, and configure the rest of the connection string (again, it is important that the NAME value here match the name defined for this connection in Web.config). Lastly, there is a drop-down selector for the provider type. The default is SQL Databases, but for Entity Framework, we want to select the “Custom” option. There are a lot of places for this to go just slightly wrong, thus borking your connection. For example, if you are developing against a local development database, and it is named slightly different than your Azure SQL Database, your will get an exception if this is not correctly addressed in the Azure Connection string. Also, there are simply a lot of places where a typographical error might creep in when replacing the values in the connection string template with your actual values. Another area to keep an eye on is that your production database on Azure is identical to your development database. While we are working under the premise that the database is driving our development, it is possible that changes may be introduced to one and not the other. Unfortunately, when we work in the Model-First approach, we don’t get the easy database creation during deployment. Therefore, it is important to keep the database schema’s in sync. Windows Azure offers a number of helpful features in this regard. I will take a closer look at the overall building out data-backed websites on Windows Azure in an upcoming post.